I'm a huge fan of sheet masks, they are an important part of my Korean / Asian skincare routine. I use them 4-5 times a week, mainly in the evening but also sometimes in the morning together with my AM routine. One of my holy grail skin care products is the Vitamin C 21.5 serum (see review here). 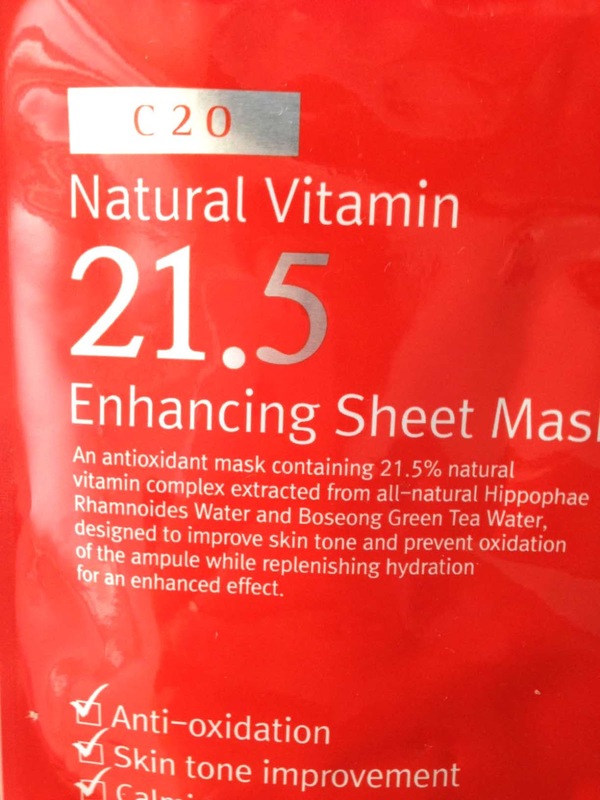 So imagine my excitement when I heard that Wishtrend was coming out with a new sheet mask, the C20 Natural Vitamin 21.5! Not long ago they were on sale on Wishtrend, the deal was very good; 20+10 for free. I ended up buying 30 sheet masks for 40$ which is really cheap if you consider that one piece normally retails at 2.90$. It was a little bit risky as the sheet masks just launched and there were no reviews of it. 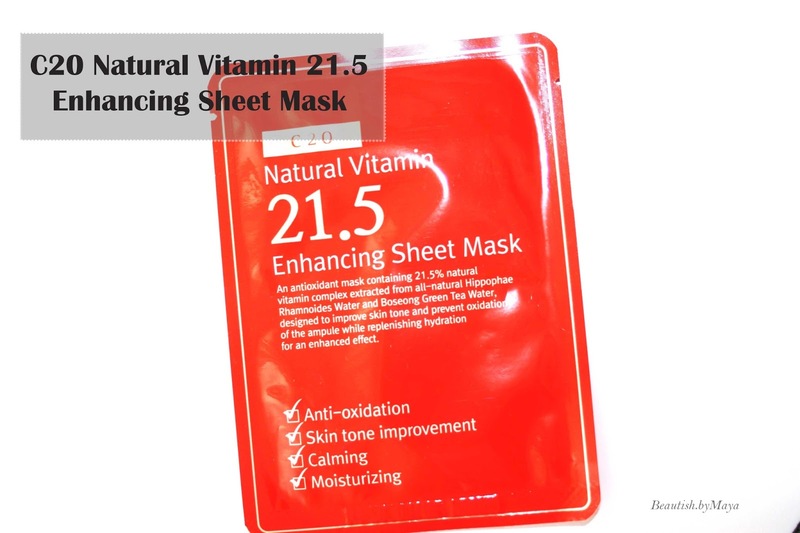 The Natural Vitamin 21.5 Enhancing Sheet Mask is supposed to be used after the Pure Vitamin C21.5 serum or any other vitamin C serum to amplify and maximize the results of whitening, moisturizing, calming, and anti aging. Recommended for: dull, boring (seriously?, probably lost in translation from Korean) and dry skin. Skin frequently exposed to harsh conditions (hot/cold/dry/etc) Current users of the C20 Pure Vitamin C21.5 Advanced Serum and Vitamin Serum users who want better effects. The formula is free of Parabens, Benzophenone, Phtalate, Phenoxyethanol, Ethanol, Mineral oils, Triethanolamine, Surfactants, Artificial colorants and perfumes. Unlike the vitamin C21.5 serum the sheet mask doesn't contain Ascorbic Acid, instead its made from 11% sea buckthorn fruit extract (Hippophae Rhamnoides L.) and 10.5% green leaf tea extract (Camellia Sinensis Leaf Extract). In total that's 21.5% vitamins, so thats why they use the same numbers here as for the serum (21.5% Ascorbic Acid). Also, unlike Ascorbic Acid its stable and doesn't need to be refrigerated. The description says that Hippophae rhamnoides has 1.3 times the absorption ability (compared to what?) increasing the effects of vitamin C tremendously when the C20 Natural Vitamin 21.5 Enhancing Sheet Mask is used after the C20 Pure Vitamin C21.5 Advanced Serum. Further Bosung Camellia sinensis (Green Tea) calms, hydrates, and nourishes the skin. The packaging is nice looks professional and modern, just like the Vitamin C21.5 serum, the same bright orange color. The description is in English, which I very much appreciate as translating from Korean can be a pain. 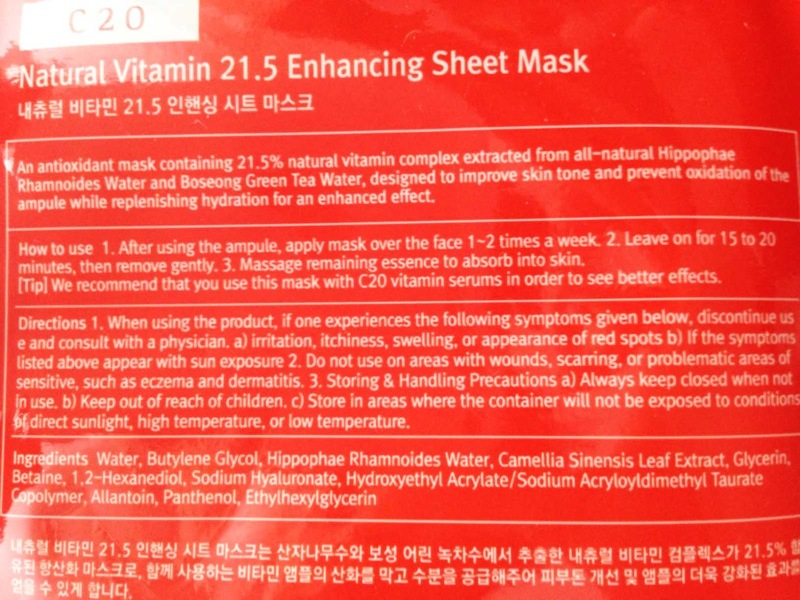 It contains 23g of serum, a regular amount for Korean sheet masks. I apply it 5 minutes after pure Vitamin C21.5 serum and leave it on for 30-45 minutes, later I proceed with serum, emulsion and moisturizer. Normally, I would use a sheet mask after my active* vitamin serum, essence and regular serum steps, but as its supposed to enhance the effect of the vitamin C21.5 serum I apply it right after vitamin C21.5 serum. Honestly, I have so many multiple steps in my skincare routine that sometimes it can be confused when to use sheet masks. Before using it I leave it for around 20 minutes in the fridge just to get that calming - cooling effect. The fit is good, much better actually than my beauty diary sheet masks. The sheet mask is really soaked in serum and adheres well to skin. My skin felt immediately cool after applying the mask to my face. I dont think it was solely the cooling effect from the refrigerator as I tend to do that with all my sheet mask before using them. The cooling effect felt very pleasant and lasted quit long for around 30 minutes. I wore the mask for 45 minutes before it felt dry on my face, there was so much serum that my chin was even drippy the whole time. 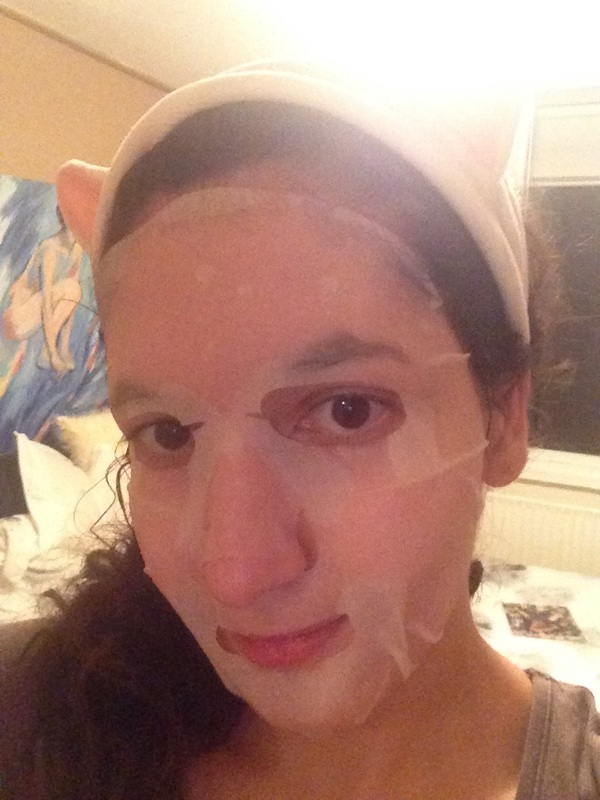 Afterwards my skin felt moisturized but nothing special, just like from an average sheet mask. Obvious was the brightening and whitening effect. My skin was glowy and brighter than before, I would say even a tone lighter. It did also a good job at reduces redness and tightening pores. There were even results I didn't expect, after using the sheet mask some clogged pores (comedones) were gone, just amazing. I have used the sheet mask a couple of times now and each time I get similar results. Do I feel like it enhances the effect of the Vitamin C21.5 serum? Its difficult to say but considering my results I would say yes. Visible results, reduced redness and a more even skin tone. No photo-editing, skin photographed under the same lightening conditions. Hippophae Rhamnoidesnis extract is known to contain vitamin C and other nutrients. I don't know the composition of Hippophae Rhamnoidesnis extract in this sheet mask, its unclear if the 11% is only for vitamin C or also other vitamins, nutrients, I think its probably the second. This means that we don't know how much of vitamin C is in there and how its absorbs. Of course its not as effective as Ascorbic Acid but my results convinced me that the effect is pretty good too. Also the sheet mask claims to contains 21.5% of vitamins not only vitamin C. Funny thing, the serum contains Hippophae Rhamnoidesnis water just as the sheet mask, so does the serum contain more than one form of vitamin C? Hence, the sheet mask is similar to serum only without the main ingredient present in the serum; Ascorbic Acid. 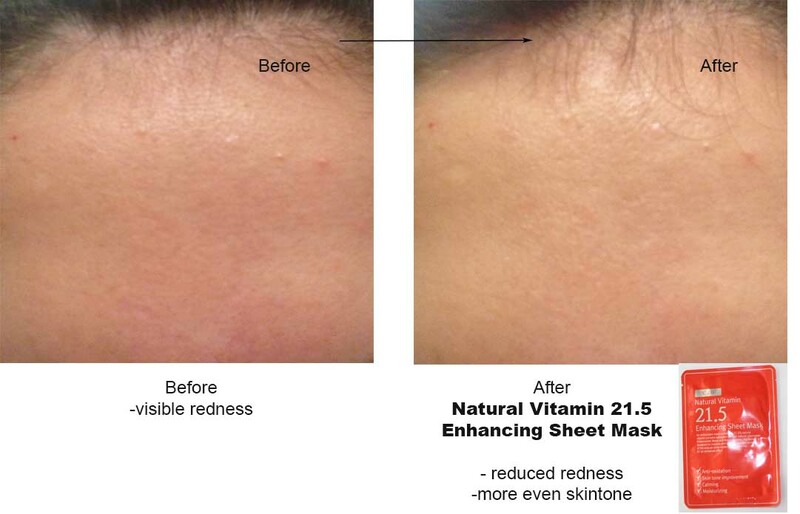 This sheet mask, Natural Vitamin 21.5 Enhancing, really impressed me! Good for brightening, whitening, reducing redness and even getting rid of some clogged pores. 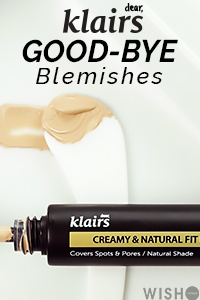 I will definitely repurchase. Overall, I do find that it enhances the effect of the Pure vitamin C21.5% serum but cant say what it means for long term use. The sheet masks are available on Wishtrend here for 2.50$ a piece and 10+1 for 21.70 $ (currency on sale). *This post contains affiliate links, shopping with them supports the blog. Umm... I NEED this :) Hoping they ship to Europe. Oh wow! This seems like a wonderful sheet mask! I feel the need to try it! Haha :) I hope I'm able to purchase it soon!